For people who love LAN parties, computer manufacturers have started selling gigantic "gaming laptops" that make moving your rig easier. For those still with a tower to move, however, there's the Hacksac. 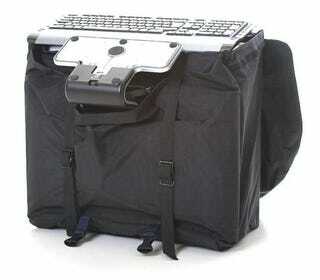 The Hacksac is a huge backpack designed to fit a tower, flat-panel monitor, keyboard, mouse and assorted cables. Sure, you'll still have 30 pounds worth of computer equipment on your back, but now you'll have it all in a bag designed for such endeavors.